It’s tough working a fruit cart in Oakland. Juana would know. She is about to be held-up and roughed-up by the thugs targeting cart workers. Frankly, it is hard to make a go of anything in the economically distressed city, but its sushi restaurants seem to be uncharacteristically healthy. 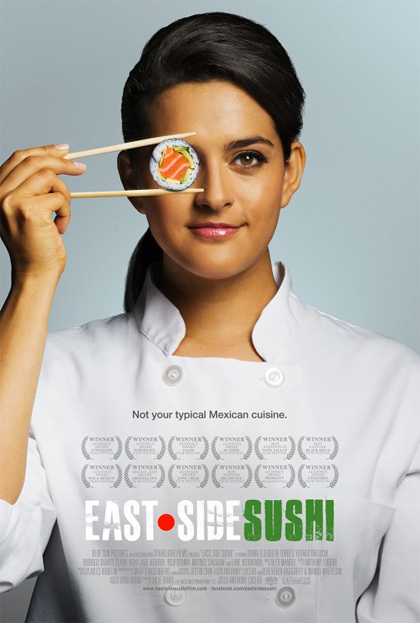 Juana will still have to create her own opportunities to become a sushi chef in Anthony Lucero’s East Side Sushi (trailer here), which opens tomorrow in Los Angeles. Even before the robbery, Juana wanted a better way of life. She thinks she might have found it in one of the Japanese restaurants owned by Mr. Yoshida. You could say he is reasonably progressive in that all kitchen employees receive health benefits, but he has very definite ideas about who can prepare sushi up front. They have to be male and Asian, preferably Japanese, or at least trained in Japan. She is neither, but as she learns from Aki, the talented but timid sushi chef, she starts to harbor ambitions. She also makes her new found passion for sushi relatively palatable for her daughter and father by incorporating poblanos and jalapenos. Maybe she’s onto something there. East Side is a hard film to take critical stock of, because it takes absolutely no risks, but there is no denying its earnestness and the charisma of its principles. If enough people see it, East Side could be a word of mouth smash, precisely because its predictable arc is like comfort food. Still, there are moments that stay with you. Lead Diana Elizabeth Torres truly brings tears to viewers’ eyes when she desperately declares “I deserve an opportunity.” You can just hear centuries of the American dream welling up under her. Likewise, Yutaka Takeuchi is terrifically understated as Aki. Roji Oyama also brings unexpected nuance to Mr. Yoshida. However, old Pops is an annoying combination of bluster and soft cultural prejudice. In general, the restaurant ensemble is much better than the home ensemble, but Torres is terrific working with both. Maybe the big sushi roll-off does not completely follow the standard issue template, but it does not deviate too far. Yet, there is no denying the film takes you to a satisfying place. All kinds of nice, East Side Sushi is recommended for people who do not go to the movies very often and want to see something a lot like the last thing they really enjoyed when it opens tomorrow (9/18) in Los Angeles at the NoHo 7.